The course lasts ﬁve days and every day’s topic is based on one of the keywords ‘Perception’, ‘History’, ‘Convention’, ‘Technology’, and ‘Legibility’. The morning sessions are used to introduce and explain the topic in general and in the afternoon and late-afternoon/evening sessions the focus is on the details, whether via demonstrations or via theory lessons. Furthermore, there is a speciﬁc research question deﬁned for every day. Not only is there are a clear ‘horizontal’ relationship between the program parts on a speciﬁc course day, also the programs of all course days are vertically interconnected. For example, the historical aspects discussed and investigated in relation to perception during the ﬁrst day are further deepened during the second day. The inﬂuence of the technical restraints in the Renaissance on typographical conventions are inextricably linked with the way modern technology is used to represent type. How does one look at type and typography and what is exactly the basis of one’s judgement? After all, one cannot see more than one knows. Welcome drink in Felix Pakhuis, Godefriduskaai 30. The question is: what exactly do we know of type and typography? Almost everyone has an opinion about letterforms and the way text is designed, and today it is very easy to express one’s unﬁltered opinion online in front of the whole world. However, having an opinion is not the same of having knowledge, of course. The métiers of the type designers and typographers are also not protected and the necessity of formal education is, not surprisingly, commonly questioned by those in the field who do not have this background, especially on type-related online forums. The role of the eye is often emphasized in this case, but if one cannot see more than one knows, what exactly does one see? Furthermore, if knowledge is lacking, what then forms the basis for one’s perception? Social and organizational psychologist Jan Dries will talk about corporate identity, communication, and behavior. How much can be distilled from artifacts if there is no documentation left from early punchcutters and typefounders? Would it be possible to reverse the argument ‘that one cannot see more than one knows’ into ‘one cannot know more than one sees’? Visit to the museum Plantin-Moretus. Demonstration of the casting of type with a handmould. How much can be distilled from artifacts if there is no remaining documentation from early punchcutters and typefounders? In Early Typefounders’ Moulds at the Plantin-Moretus Museum (1974) Mike Parker notes that little is known of very early type founders’ moulds. In fact, there seems to be no documentation on the production of type dating from the early days of typography at all. Everything written on Renaissance type production so far is a projection of seventeenth and eighteenth century descriptions of type-foundry practices. These sources put a lot of emphasis on the role of the eye. Is it perhaps possible that later punchcutters could mostly rely on the eye because for them optical judgment took for granted the underlying patterns, almost unconsciously? Was it simply the framework in which things were done? In comparison to punchcutters, present-day digital type designers have the almost unlimited freedom to define the proportions and widths of characters. This also makes it possible to emphasize optical matters. However, this freedom was not available in the early days of typography and should therefore not be used to explain the proportions of typographic letterforms, which have been an intrinsic and salient characteristic of typography since the second half of the fifteenth century. A closer look at artifacts from the collection of the Museum Plantin-Moretus for example could provide more information on historical technical constraints. After all, for understanding the historical developments of type and typography, insight in the technical constraints is a prerequisite. Guy Hutsebaut, technical expert at the Museum Plantin-Moretus, will demonstrate the casting of type, for example, with ﬁxed registers. For this demonstration he will use original matrices from famous Renaissance punchcutters, such as Claude Garamont and Robert Granjon. Hand moulds from the Renaissance will also be demonstrated, such as a mould from Hendrik van den Keere. In the second part of the afternoon session, book-historian Goran Proot will guide a tour through the museum. In the connecting late-afternoon session Proot will show and discuss a selection of famous books printed by Christoffel Plantin, among which the Biblia Polyglotta from 1568–1572. The combination of different types representing different scripts in this Bible is very interesting, if only because this even would be a challenge with the sophisticated present-day digital tools. Interestingly, the non-Latin types in the Biblia Polyglotta were cut by European punchcutters and adapted to a technology that initially was developed for type that only represented the Latin script. Are typographical conventions based on absolute and undeniably – empirically – proven facts, or simply only relative to the nature, i.e., the structure and properties, of specific type and not per se interchangeable with other forms of type (for other scripts). Are typographical conventions based on absolute and undeniably – empirically – proven facts, or simply only relative to the nature, i.e., the structure and properties, of specific type and not per se interchangeable with other forms of type (for other scripts)? The term ‘convention’ in relation to typography is often used as synonym of tradition. Some experts suggest that the reason that letterforms have undergone very little change since Jenson and Griffo is probably because these had already largely crystallized and adapted to the ergonomic needs of the readers. Considering the facts that Jenson’s roman distinctively deviates from the Humanistic minuscule and that the type was developed in a relatively short period of time, it seems just as plausible that this archetypal model largely defined the ergonomic needs of the reader. Lara Captan, Arabic type designer & typographer, will show and discuss the details of Arabic type and the (constraints of the) different present-day digital technologies on these details. She will also place this in a wider historical context. For example, the Arabic type that Granjon cut was simpliﬁed to ﬁt the movable-type technology, and the Arabic type, which was produced for the Linotype ‘hot-metal’ type caster centuries later, was also simpliﬁed because of technical constraints. The resulting type was coined ‘Eurabic’ by expert Thomas Milo. If these simpliﬁed forms were accepted in Arabic countries and considered usable, why would a more complex variant relying on, for example, OpenType Layout features be required? Is this because (type) designers consider this important, or is it something that is driven by the possibilities of Western technology, like the constraints restricted the possibilities many centuries ago? In other words: is the result Eurabic still? Walda Verbaenen is a laureate from the Expert class Type design (EcTd), who together with EcTd-laureate Michel Paré is researching and reviving type from the 18th-century Belgian punchcutter Jacques-François Rosart. Verbaenen will talk about what exactly the value of knowledge of historical type-foundry practices and the bases of conventions is for her research. Without question it would be possible to revive Rosart’s type without this knowledge, although the perception and hence interpretation of the historical material would be questionable. However, the majority of the endusers lack this knowledge too, so why bother? Are the proportions and details of (digital) type purely the result of visual preferences or are they the result of adapting letter forms to both the technical constraints of the Renaissance type production and optical preferences. What is exactly the inﬂuence of the present-day digital technology on type? What exactly is the inﬂuence of the present-day digital technology on type? The conventions that are firmly entrenched in Jenson’s technical constraints continue to influence our view on type today, although the versatility of digital technology makes it possible to put the emphasis largely on the eye. By extrapolating the current situation and without in-depth insight in the constraints of the Renaissance type production, we tend to think of early punchcutters like Jenson, Griffo, Garamont, and Granjon, merely as type designers. Details found in their types are considered the result of particular optical preferences but in any case the early punchcutters had to balance technical constraints with visual preferences. Times are undoubtedly changing and new technologies make other design and production methods possible, for example, not many type designers make analogue drawings anymore. Is there a better way to learn the tension of curves, the (relation between the) quality of contours and counters, and to understand that a speedy process is not always the best way to preserve the highest quality, than drawing with pencil, pen, and brush? The fact that drawing on paper has become less and less common in the métier of the type designer, may be the result of a lack of training, and hence, of the speciﬁc skills required for analog drawing. Software engineer Dr. Juergen Willrodt, programmer of font-production software since the early 1980s, will discuss the development of (what is under the hood of) the font technology since the IKARUS format from the 1970s. What exactly changed in the past 40 years and what has become technically possible, especially for complex scripts like Arabic and Indic? Are there objective criteria for legibility, i.e., can this universally be measured, or is legibility purely relative to the harmonic and rhythmical aspects of the models for speciﬁc scripts that are used to condition the reader (which partly are the result of standardization because of technical constraints)? Visit to the private collection of printing presses, typesetting machines and typefounders’ material from Patrick Goossens. There is clearly not much exchange of knowledge between scientists who investigate legibility and type designers. Outcomes of legibility research seem in general ignored by the latter and scientists consider this a mistake. However, it is unlikely that Jenson and Griffo did any legibility research before they developed their archetypal models. These two punchcutters, nor any of their Renaissance colleagues, seem to have investigated the physiological structure of the human visual system in relation to type. The fact that light falling on the retina excites photoreceptors, was most probably completely unknown to them. Later in the Renaissance, more became known about the real functioning of the eye. Leonardo Da Vinci researched the subject and his idea that vision ‘is a result of the eye receiving rays of light’ was different from the generally accepted idea ‘that humans had vision because of tiny particles projected from the eye’. In 1604 Johannes Kepler demonstrated the physics behind the optical workings of the eye as an aside of his astronomical work Supplements to Witelo, On the Optical part of Astronomy. For the first time, oculists had begun to accept the retina – and not the lens as it had been assumed since antiquity – as the organ of vision. However, there is no evidence that these outcomes were taken into account by the 17th-century punchcutters. Type designers seem to rely purely on their eyes, but what they see is mostly, if not all, the result of conditioning. Conditioning is based on conventions and conditioning preserves conventions. Thus the snake bites its own tail: to be able to use one’s ‘eye’, one has to be educated to look at type in a common way. Type designers make variants within or outside the borderlines of the conventions and these conventions are obviously ﬁxed enough, i.e., provide a safely marked territory, to ignore research such as on ‘visual acuity or eye movement habits’. The fact that ‘serifs are important in the perception of small letters by humans may not come up literally into the minds of type designers, but they are educated in a typographical tradition that is based on serifed letters. Research by renowned scientists in the ﬁeld of legibility, such as Poulton and Tinker, did not prove that serifed typefaces are more legible by definition than sans-serif ones. There still seems to be a general agreement on the fact that serifed type is more legible. How come? 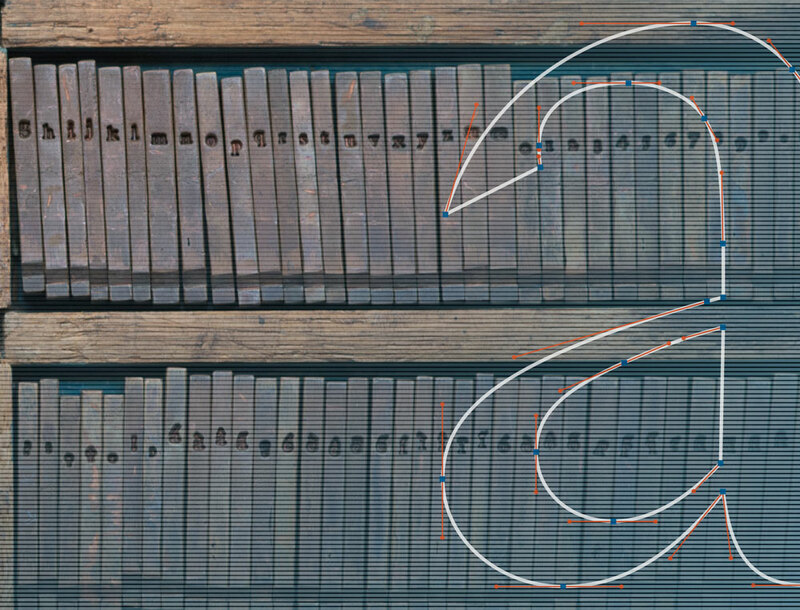 Patrick Goossens, researcher and collector of 19th-century font-production tools, will demonstrate, for example, the production of type using the Benton pantograph (engraving machine). This will be a hands-on session, which will enable the students to empirically investigate the inﬂuence of technical constraints on the type produced.